Sprayed skins for vehicle instruments and controls and for airbag cladding are sprayed in a heated mold using a robot-guided nozzle. Here, tight tolerances are required, particularly with the airbag as a safetycritical part. For this reason the thickness of the sprayed skin must be inspected during the spraying process. 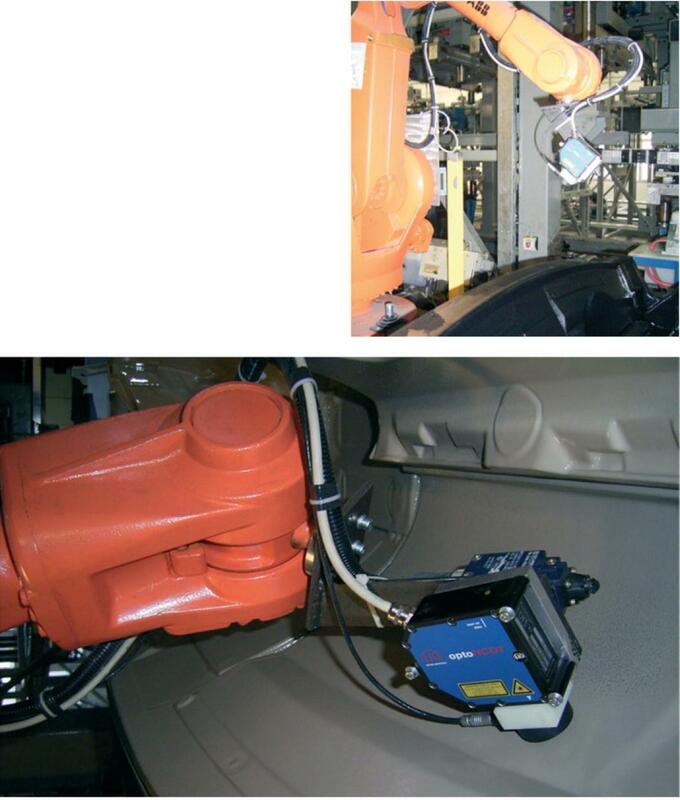 To achieve this, the combination sensors are attached directly to the robot arm. An EU15(05) eddy current sensor in combination with an optoNCDT laser-based optical triangulation sensor is used. The eddy current sensor measures the distance to the nickel-coated spray mold. The eddy current sensor has an opening in the center through which the optoNCDT laser sensor measures the distance to the sprayed part. When subtracted, both signals provide the thickness of the applied sprayed skin. EU15(05) eddy current sensor with through hole for laser triangulation sensor. – No axis displacement, because the laser triangulation sensor measures through the eddy current sensor. 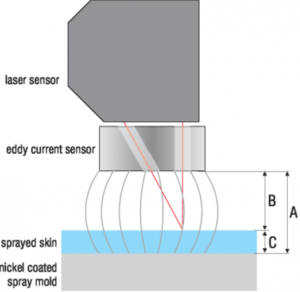 Principle: The eddy currents go “through” the sprayed skin to the nickel coated spray mold. The laser sensor supplies the reference distance to the skin surface. The processed signals are computed with each other to result the exactthickness signal (A- B=C).